TimberTech's collection light brown decking is perfect if you're looking to brighten up your outdoor living space while adding a touch of natural woodlands. Manufactured through the combination of polymer resin and natural hardwood, these beautifully warm light brown composite decking boards bring together a modern look with a traditional timber feel, a must-have for any sleek and stylish outdoor space. Our range of light brown composite decking can be used to create an outdoor space of true beauty. With an organic and authentic attraction of natural hardwood timber, these stunning boards are perfect for any decking design. A robust and long-lasting flooring option, with near enough zero upkeep requirements, you cannot go wrong with our light brown decking. To see how our composite deck boards can be used to achieve the space that you always wanted, watch our showcase video here. Through their revolutionary design, our light brown composite deck board require practically zero maintenance requirements. An ideal alternative to natural wood and plastic decking, our light brown decking will never need to be sealed or painted and is guaranteed to not decay, split or rot! Produced with the highest quality of materials that includes polymer resin and natural hardwood, our light composite decking is extremely hard-wearing and robust, meaning you do not have to worry about fades or stains ruining your gorgeous new deck! As a result of their long-lasting nature, every one of our light brown decking boards comes with a standard 30-year warranty. Through its state-of-the-art design, your deck will not be affected by rot, decay or splinters for three whole decades! Available in varying styles, our range of light brown decking boards are perfect for a number of different designs and tastes. 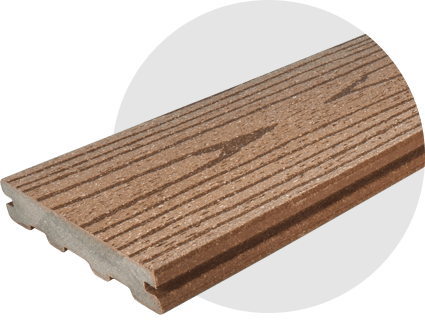 The texture surface of our light brown deck boards also differ between linear wood grain, flat wood grain and grained capped with a fully protective polymer sleeve. 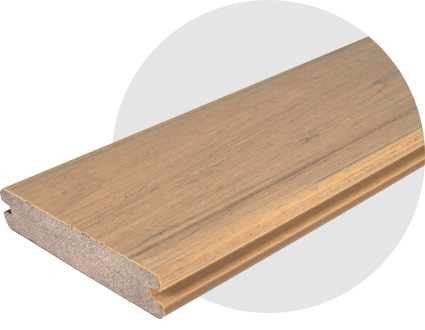 The board itself is available in two options: a wood-polymer composite, which is non-capped or fully capped composite for an easy-clean surface. The fastening method that you choose to implement will also have a bearing on the style of board that you will need. Styles are available in both grooved and ungrooved.